Kaup Beach is one of the major beaches in the city of Mangalore. With its tropical climate and bevy of attractions that beckon tourists from across the country, Mangaluru is a port city that promises to keep uplifting your spirits every minute you spend in this city. Mangalore was developed as a port city located on the shores of the Arabian Sea amidst the backwaters of the rivers Netrapathi and Gurupura. Named after the Hindu goddess Managaladevi, Mangalore remains one of the busiest ports in the country along the Malabar Coast. With a host of languages including the likes of Tulu, Kannada, and Konkani being spoken here, the city retains its old world charm and beckons a variety of tourists, thereby proving its worth as an ideal weekend getaway. Kaup or Kapu as the place is known in the local Tulu language is a village town located between Udupi and Mangaluru in the state of Karnataka. The region is predominantly known for one of the most serene and pristine beaches that you can find. Owing to the greenery surrounding the beach on all sides, tourists make a bee-line towards this place for a quick weekend trip away from the hustle and bustle of the city. 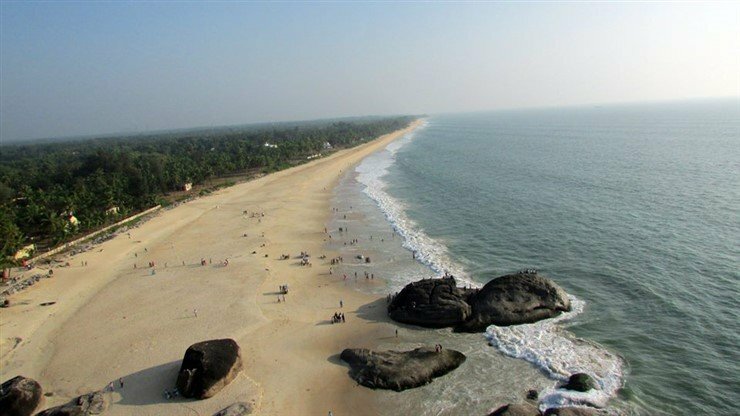 Although Kaup hasn’t been explored on a full-fledged level, the beach attracts many tourists and there have instances of films being shot in the beach and the surrounding areas as well. Kaup beach is famously known to house an old lighthouse that was apparently built in the year 1901. The lighthouse is open for visitors during certain periods of time in the course of the day. It offers a delightful view of the entire beach and seashore that will surely take your breath away. Besides the lighthouse, Kaup also has ruins of Jain Basadis that line across the stretch of sand, and these are definitely worth a visit. Kaup is the base for two Hindu temples dedicated to the Goddess Mariamman. The best time to visit Kaup Beach is from October to December. This beach is also popular with students who come from Manipal, a student town. The beach also has small shacks and eateries where one can sample a bit of the local cuisine. By Air: The nearest airport is Mangalore. Thereafter, you have to make a trip by road. By Rail: The nearest stations are at Udupi and Mangalore. Kaup is a 25-minute journey from the town of Udupi. By Road: Owing to its apt location on the West Coast National Highway between Udupi and Mangaluru, Kaup is best accessible by road. The distance between Kaup and several other places can be calculated as follows: Udupi (12 km), Mangalore (45 km), Bengaluru (410 km), and Manipal (15 km). There are regular buses that ply between the aforementioned cities/towns that connect Kaup. With its stretches of white sands, perfect location and idle atmosphere, Kaup is a place that you’ll never want to leave, thanks to its pristine beauty.